Providing peace of mind for generations of families and businesses. Putting clients first and providing straightforward advice conveyed in a clear and concise way. Delivering sound, practical legal advice that represents best value and protects your personal or business interests. Thomson Snell & Passmore's particular strengths are customer care and the speed at which they respond. Often when you are dealing with complicated issues speed is of the essence. I have not seen any weakness. TS&P make no bones about the high standards to which they aspire - and they delivered on that aspiration. Thomson Snell & Passmore's strengths are knowledge of my organisation and good client relationship. It feels like they are an extension of the in house team. Thomson Snell & Passmore is a dynamic and ambitious law firm in-tune with the business community in its area. It understands how to deliver first class legal advice in a way which is directly relevant to its clients' needs. London may be nearby but there is no need to travel there for high quality service. The whole ambiance of the building and surroundings gives you a feeling, as the client, that this is a quality firm. Continuity since 2006, and good experience on several issues where they have advised. I really appreciated the supportive approach, everyone I came in contact with from start to finish from Thomson Snell & Passmore from the partners involved to the admin support were excellent. The family of my partner have been with TSP over 100 years. Thomson Snell & Passmore are established trusted advisors who are able to tailor their advice based on sound understanding of the our business. As a Charity CEO working on complex governance issues, where the interpretation of Charity Law can become quite nuanced, the help and advice of Thomson Snell and Passmore is invaluable. Being able to think through the issues with an experienced, critical friend has enabled me to confidently assure and advise my Board and make clear, well thought through decisions. I can highly recommend Thomson Snell and Passmore as they work with integrity and share our values. An established company who provide personal service. 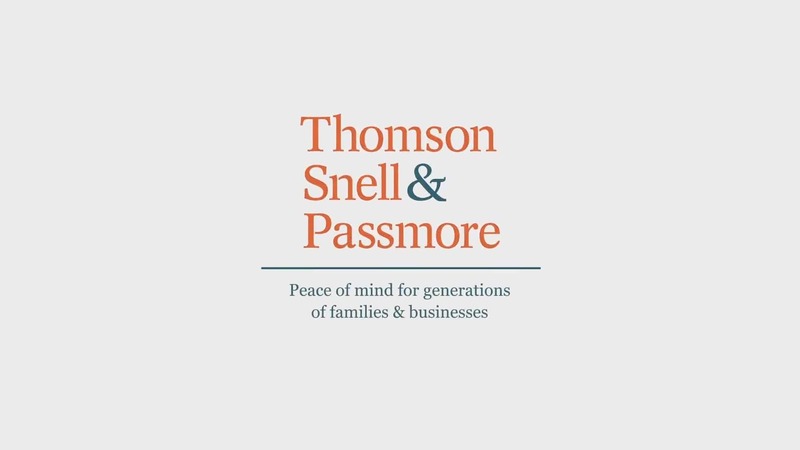 Thomson Snell & Passmore is a law firm with a reputation for providing high quality, intelligent advice and the very best service to our clients. Our legal advisers provide a comprehensive range of services to both businesses and individuals across a wide range of practice areas including corporate, dispute resolution, commercial property, employment, family, residential conveyancing, estate planning, wills, probate, Court of Protection, clinical negligence and personal injury. You can discover more how we help clients on the following link About Us. Despite the uncertainty, over 90% of respondents consistently answer they would not change their vote if there was another referendum. Dealing with probate can be extremely stressful, particularly if the estate of the deceased is not straightforward. Our specialist lawyers are experienced in all aspects of probate matters and can support you as much, or as little, as you like. Dubbed a “stealth tax” by critics, probate costs will increase under controversial plans to introduce a new sliding scale of fees. Thomson Snell & Passmore has been named as one of the Top Law Firms for its private wealth practice for the fifth consecutive year. You may think in your 20's that you don't need a lawyer, but if you are thinking of buying your first home or wondering what legal advice you need when setting up a business, Faye Cook and Stuart Price will give you the heads up on 20 Legal things you really should be aware of in your 20's. Click the button below to read our selection of articles, written by junior lawyers from across the firm. Our lawyers are well established in Kent and across the South East, and are recognised in a wide range of sectors such as charity, education, transport and logistics, construction, food and beverage and agricultural law, enabling us to provide a comprehensive service to our clients. To find out more about our sectors please visit For Your Sector. Our lawyers follow a tried and tested approach to ascertain your legal needs, enabling us to provide a solution that has many of our clients returning to use our services time and time again - and it's why 30 of our specialist practice areas are ranked by the leading independent guides to UK law firms. To see how we rank visit our awards page Awards, Rankings & Accreditations.